Many people receive gift orchids purchased at local grocery stores or at “big box” stores such as Home Depot or Lowe’s. Nearly all of the orchids sold in these stores are members of the genus Phalaenopsis, known as moth orchids because of the shape of their flowers. These very popular orchids can be recognized by their single stem and wide, flat leaves. The flowers, usually quite large, are borne along a long spike and are typically colored white, pink, lavender or yellow. Some come in solid hues, while others sport an array of spots, stripes, and other markings in a range of colors. Phalaenopsis orchids make great house plants, and are good companion plants for African violets, as both have similar requirements in terms of light, temperature, humidity and amount and frequency of watering. 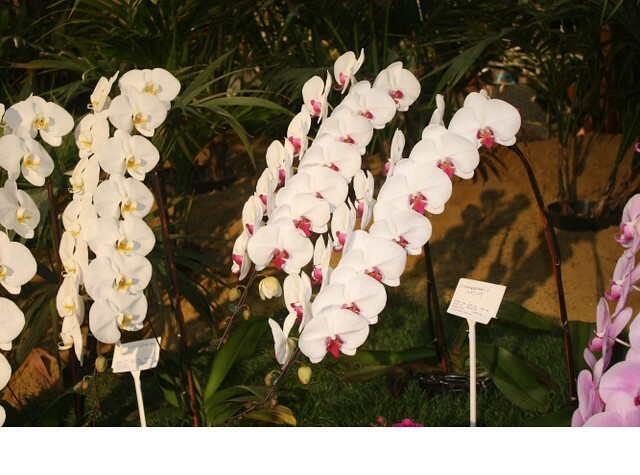 A word of caution: Do not put Phalaenopsis orchids in direct sunlight or in temperatures below 50 degrees. Moth orchid flowers last for several weeks, and plants will live for many years with proper care. A plant will typically bloom at more or less the same time every year, and can be displayed anywhere in or out of the house for your enjoyment while in flower. As the flowers begin to die, the plant should be moved back to a situation that encourages growth of the vegetative portion. Moth orchids are best grown in low light, either in partial shade outdoors, or indoors in a bright window or under artificial lighting. If Phalaenopsis are grown under artificial light, you have to be careful to watch for the development of new flower stems, and be sure to move the plant away from the lights before the stem touches the bulbs. As with African violets, fluorescent lighting is preferred over incandescent because of the heat from the latter. The lighting arrangement I used for many years was four 4-foot-long fluorescent tubes over a 2-foot-wide shelf holding the plants. Today, with the availability of many different lighting types, you can be more creative with artificial lights. Or, you may have a bright east-facing window to provide all-natural lighting. It is often easiest to move plants for watering, then return them to the window or light stand. An important note: Because the flower stem points towards the light as it grows, be sure not to change the plant’s orientation when returning it to the growing area or the stem will be crooked. Moth orchids will thrive in temperatures from 60 degrees to 95 degrees. Outdoors with summer breezes or indoors with fans, they can withstand up to 100 degrees if the light isn’t too bright. If grown outdoors, they should be brought inside when night temperatures dip below 50 degrees. However, keeping them outdoors for a few weeks in the fall, when night temperatures are in the mid to upper 50s or near 60, will help initiate new flower stems. Once the flower stem has started to develop, the plant(s) can be brought indoors and the stem will continue to grow. This is safer than leaving them outdoors with the potential of damage to the plant from cold weather. Even Houston’s relatively mild winters are too cold for these tropical plants. Conditions outdoors in Houston usually provide plenty of humidity for these plants. Phalaenopsis plants prefer a minimum of 50 percent humidity, and their flowers will last longer with even higher humidity levels. If we get a dry spell in the summer, you can help the plants by watering more often. Indoors, humidity levels rarely get above 50 percent, and both heating and air conditioning units remove humidity from the air. So if and when orchids are grown inside, you will need to increase the humidity in the orchids’ vicinity. A pebble tray is an easy and inexpensive way to enhance humidity levels. Fill a shallow tray with pebbles or rocks. Add water to about half way and set the orchid pots on top of the pebbles. The water level should be below the pots (you aren’t using this arrangement to water the orchids). Water evaporating from the pebbles’ surface adds to the humidity surrounding the plants. You may need to add more water daily if your house is especially warm or dry. To control algal growth on the rocks and in the water, you may also want occasionally to add a bit of bleach. The watering technique for Phalaenopsis (and most other orchids) is a little different than for most house plants. Why? Because in their natural habitat, these orchids don’t grow with their roots in the ground. They are “epiphytes” or “air plants,” and grow on tree trunks and tree limbs throughout much of tropical southeast Asia. Because of their growth habit, orchids need more air circulating around their roots than other house plants and will not survive if their roots are always wet. Phalaenopsis are often grown and sold in tightly packed sphagnum moss. Sphagnum retains water a long time so it doesn’t dry out as fast as many other potting media. If your orchid is growing in sphagnum, a thorough watering every other week is frequent enough. Another popular growing medium for Phalaenopsis and other orchids is fir bark or fir bark mixes. This medium dries out much faster than sphagnum, so orchids in bark or bark mixes should be given a thorough watering about once a week. In either case, you should water until water comes out the drainage holes in the pot. Let the excess water drain out before putting the plant back in its growing area. If plants are outdoors, the watering schedule should be adjusted depending on the weather. Last year was so dry that plants needed to be watered twice a week. A few years back it rained every day in July; under such conditions, Phalaenopsis plants growing outdoors should be protected from the rain. Otherwise, their roots will become water logged and will rot, eventually killing the plant. 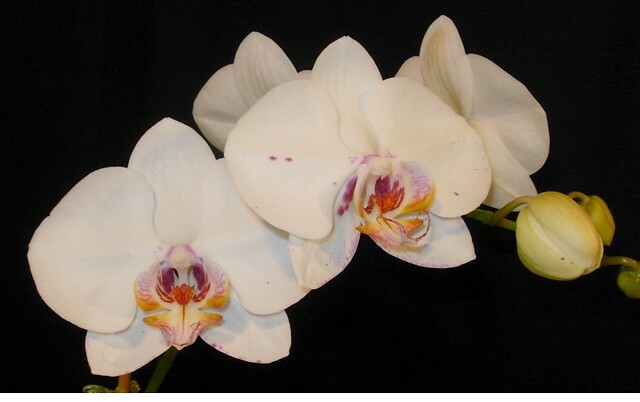 Phalaenopsis orchids need fertilizer to grow and bloom successfully. Since the plants never stop growing, they need to receive at least some food (fertilizer) year-round. A weekly application of a dilute fertilizer solution works well. Almost any fertilizer sold for orchids will work just fine if used at quarter strength in the fall and winter, and half strength the rest of the year, each time you water. However, once a month, skip the fertilizer and use water only. You can learn additional care tips for Phalaenopsis and other orchids at the Houston Orchid Society meetings held monthly at the Houston Garden Center. Many of the lovely moth orchids, along with many other orchid varieties, will be on exhibit and for sale at the Houston Orchid Society Annual Show and Sale, held this year on April 20 and 21 in the Grand Hall of the Museum of Natural Science. Don’t miss this spectacular show! i need to know how often to water cattyleas, oncidiums now that its march. i live in galvaston county tx. Depending on species it can vary a lot, but on average Oncidiums prefer to stay fairly moist and Cattleyas like to dry out between waterings. If they’re outside and potted I’d say about twice a week for the Oncidiums and once a week for the Cattleyas. I like to add some fertilizer (half of whatever the recommended dose on the package is) at every other watering while the plants are actively growing. If they’re mounted on wood they would need to be watered pretty much every day. Hope this helps! Next Post Walk like an Egyptian this weekend at HMNS Sugar Land!